Herod Antipater (Greek: Ἡρῴδης Ἀντίπατρος, Hērǭdēs Antipatros; born before 20 BC – died after 39 AD), known by the nickname Antipas, was a 1st-century ruler of Galilee and Perea, who bore the title of tetrarch ("ruler of a quarter") and is referred to as both "Herod the Tetrarch" and "King Herod" in the New Testament although he never held the title of king. He is widely known today for accounts in the New Testament of his role in events that led to the executions of John the Baptist and Jesus of Nazareth. 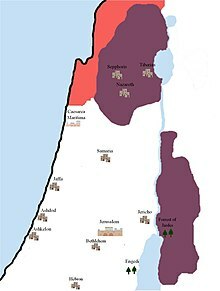 After being recognized by Augustus upon the death of his father, Herod the Great (c. 4 BC/AD 1), and subsequent ethnarch rule by his brother, Herod Archelaus, Antipas officially ruled Galilee and Perea as a client state of the Roman Empire. He was responsible for building projects at Sepphoris and Betharamphtha, and more important for the construction of his capital Tiberias on the western shore of the Sea of Galilee. Named in honor of his patron, the emperor Tiberius, the city later became a center of rabbinic learning. Antipas divorced his first wife Phasaelis, the daughter of King Aretas IV of Nabatea, in favour of Herodias, who had formerly been married to his half-brother Herod II. (Antipas was Herod the Great's son by Malthace, while Herod II was his son by Mariamne II.) According to the New Testament Gospels, it was John the Baptist's condemnation of this arrangement that led Antipas to have him arrested; John was subsequently put to death in Machaerus. Besides provoking his conflict with the Baptiser, the tetrarch's divorce added a personal grievance to previous disputes with Aretas over territory on the border of Perea and Nabatea. The result was a war that proved disastrous for Antipas; a Roman counter-offensive was ordered by Tiberius, but abandoned upon that emperor's death in 37 AD. In 39 AD Antipas was accused by his nephew Agrippa I of conspiracy against the new Roman emperor Caligula, who sent him into exile in Gaul. Accompanied there by Herodias, he died at an unknown date. The Gospel of Luke states that Jesus was first brought before Pontius Pilate for trial, since Pilate was the governor of Roman Judea, which encompassed Jerusalem where Jesus was arrested. Pilate initially handed him over to Antipas, in whose territory Jesus had been most active, but Antipas sent him back to Pilate's court. Antipas was a son of Herod the Great, who had become king of Judea, and Malthace, who was from Samaria. His date of birth is unknown but was before 20 BC. Antipas, his full brother Archelaus and his half-brother Philip were educated in Rome. Antipas was not Herod's first choice of heir. That honor fell to Aristobulus and Alexander, Herod's sons by the Hasmonean princess Mariamne. It was only after they were executed (c. 7 BC), and Herod's oldest son Antipater was convicted of trying to poison his father (5 BC), that the now elderly Herod fell back on his youngest son Antipas, revising his will to make him heir. During his illness in 4 BC, Herod had yet another change of heart about the succession. According to the final version of his will, Antipas' elder brother Archelaus was now to become king of Judea, Idumea and Samaria, while Antipas would rule Galilee and Perea with the lesser title of tetrarch. Philip was to receive Gaulanitis (the Golan Heights), Batanaea (southern Syria), Trachonitis and Auranitis (Hauran). Because of Judea's status as a Roman client kingdom, Herod's plans for the succession had to be ratified by Augustus. The three heirs therefore travelled to Rome to make their claims, Antipas arguing he ought to inherit the whole kingdom and the others maintaining that Herod's final will ought to be honored. Despite qualified support for Antipas from Herodian family members in Rome, who favoured direct Roman rule of Judea but considered Antipas preferable to his brother, Augustus largely confirmed the division of territory set out by Herod in his final will. Archelaus had, however, to be content with the title of ethnarch rather than king. Domain given to Herod Antipas, as Tetrarch of Galilee and Perea, by Augustus in 4 BCE. In 6 AD, Archelaus was deemed incompetent by Augustus and replaced with a prefect. As a result, Antipas would govern Galilee and Perea for the next forty-two years. The two territories were separated by the region of the Decapolis, with Galilee to the north and Perea to the south (see map). Threats to stability in both areas would have been clear to Antipas when he took office. While he had been making his case to Augustus in Rome, dissidents led by Judas son of Hezekiah had attacked the palace of Sepphoris in Galilee, seizing money as well as weapons which they used to terrorize the area. In a counterattack ordered by Quinctilius Varus, Roman governor of Syria, Sepphoris was destroyed by fire and its inhabitants sold as slaves. Perea, meanwhile, bordered on the kingdom of Nabatea, which had long had uneasy relations with Romans and Jews. Part of Antipas' solution was to follow in his father's footsteps as a builder. He rebuilt and fortified Sepphoris, while also adding a wall to Betharamphtha in Perea. The latter city was renamed Livias after Augustus' wife Livia, and later Julias after his daughter. However, the tetrarch's most noted construction was his capital on the western shore of the Sea of Galilee – Tiberias, so named to honor his patron Tiberius, who had succeeded Augustus as emperor in 14 AD. Residents could bathe nearby at the warm springs of Emmaus, and by the time of the First Jewish-Roman War the city's own buildings included a stadium, a royal palace and a sanctuary for prayer. It gave its name to the sea and later became a center of rabbinic learning. However, pious Jews at first refused to live in it because it was built atop a graveyard and therefore a source of ritual impurity; Antipas had to colonize it using a mixture of foreigners, forced migrants, poor people and freed slaves. At other times Antipas was more sensitive to Jewish tradition. His coins carried no images, which would have violated Jewish prescriptions against idolatry. When Pontius Pilate, governor of Judea from 26 AD to 36 AD, caused offence by placing votive shields in the Antonia palace at Jerusalem, Antipas and his brothers successfully petitioned for their removal. Early in his reign, Antipas had married the daughter of King Aretas IV of Nabatea. However, on a visit to Rome he stayed with his half-brother Herod II and there, he fell in love with his wife, Herodias, (granddaughter of Herod the Great and Mariamne I), and the two agreed to marry, after Herod Antipas had divorced his wife. Aretas' daughter learned of the plan and asked permission to travel to the frontier fortress of Machaerus, whence Nabatean forces escorted her to her father. With his daughter now safe in his custody, Aretas now could declare war on Herod. It is generally agreed that the war, in which Herod was defeated, occurred in 36, a year before the death of the emperor Tiberius. A point of contention today is how long before this date Herod's marriage to Herodias took place. Some surmise that the marriage of Antipas and Herodias took place shortly before the war in about the year 34, after the death of Philip, but others have pointed to Josephus' Antiquities of the Jews Book 18, chapter 5, paragraph 4 comment that Herodias "divorced herself from her husband while he was alive" to argue that it took place before Herod II's death, in about the year 27, thus making it possible for Jesus to have been born in the reign of Herod the Great (as indicated by the Gospel of Matthew) and to have died in his early 30s (as indicated by the Gospel of Luke). Antipas faced more immediate problems in his own tetrarchy after John the Baptist – in 28/29 AD according to the Gospel of Luke (or 27 AD, if the co-regency of Augustus and Tiberius is included in Luke's reckoning of time, for which there is some evidence) – began a ministry of preaching and baptism by the Jordan River, which marked the western edge of Antipas' territory of Perea. The New Testament Gospels state that John attacked the tetrarch's marriage as contrary to Jewish law (it was incestuous, as Herodias was also Antipas' niece, but also John criticized the fact that she was his brother's wife in Mark 6:18, lending credence to the belief that Antipas and Herodias married while Herod II was still alive), while Josephus says that John's public influence made Antipas fearful of rebellion. John was imprisoned in Machaerus and executed. According to Matthew and Mark, Herod was reluctant to order John's death but was compelled by Herodias' daughter (unnamed in the text but named by Josephus as Salome), to whom he had promised any reward she chose as a result of her dancing for guests at his birthday banquet. Among those baptized by John was Jesus of Nazareth, who began his own ministry in Galilee – causing Antipas, according to Matthew and Mark, to fear that the Baptiser had been raised from the dead. Luke alone among the Gospels states that a group of Pharisees warned Jesus that Antipas was plotting his death, whereupon Jesus denounced the tetrarch as a "fox" and declared that he, Jesus, would not fall victim to such a plot because "it cannot be that a prophet should perish away from Jerusalem". Luke also credits the tetrarch with a role in Jesus' trial. According to Luke, Pilate, on learning that Jesus was a Galilean and therefore under Herod's jurisdiction, sent him to Antipas, who was also in Jerusalem at the time. Initially, Antipas was pleased to see Jesus, hoping to see him perform a miracle, but when Jesus remained silent in the face of questioning Antipas mocked him and sent him back to Pilate. Luke says that these events improved relations between Pilate and Herod despite their earlier enmity. The reason for Antipas' involvement has been debated. Theodor Mommsen argued that the normal legal procedure of the early Roman empire was for defendants to be tried by the authorities of their home provinces. A. N. Sherwin-White re-examined the relevant legal texts and concluded that trials were generally based on the location of the alleged crimes, but that there was a possibility of referral to a province of origin in special cases. If Pilate was not required to send Jesus to Antipas, he may have been making a show of courtesy to the tetrarch and trying to avoid the need to deal with the Jewish authorities himself. When Jesus was sent back, Pilate could still have represented Antipas' failure to convict as support for his own view (according to Luke) that Jesus was not guilty of a capital offence, thus allowing him to avoid responsibility for Jesus' crucifixion. Due to the lack of historical evidence, it has been suggested that Jesus' trial by Herod Antipas is unhistorical. Robin Lane Fox, for example, an English historian, claims that the story was invented based on Psalm 2, in which "the kings of the earth" are described as opposing the Lord's "anointed", and also served to show that the authorities failed to find grounds for convicting Jesus. Between 34 and 36 AD the conflict with Aretas of Nabatea, caused by Antipas' divorce from Aretas' daughter and the rulers' disagreement over territory, developed into open war. Antipas' army suffered a devastating defeat after fugitives from the former tetrarchy of Philip sided with the Nabateans, and Antipas was forced to appeal to Tiberius for help. The emperor ordered Lucius Vitellius, governor of Syria, to march against Aretas and ensure that he was captured or killed. Vitellius obediently mobilized two legions, sending them on a detour around Judea while he joined Antipas in attending a festival at Jerusalem. While staying there he learned of the death of Tiberius (16 March 37 AD), concluded he lacked the authority to go to war, and recalled his troops. Josephus implies that Vitellius was unwilling to cooperate with the tetrarch because of a grudge he bore from an earlier incident. According to his account, Antipas provided hospitality at a conference on the Euphrates between Vitellius and King Artabanus III of Parthia, and after Vitellius' diplomatic success anticipated the governor in sending a report to Tiberius. However, other sources place the meeting between Vitellius and Artabanus under Tiberius' successor Caligula, leading some historians to think that Josephus misdated it to the reign of Tiberius or conflated it with an earlier diplomatic meeting involving Antipas and Vitellius. Antipas' fall from power was due to Caligula and to his own nephew Agrippa, brother of Herodias. When Agrippa fell into debt during the reign of Tiberius despite his connections with the imperial family, Herodias persuaded Antipas to provide for him, but the two men quarrelled and Agrippa departed. After Agrippa was heard expressing to his friend Caligula his eagerness for Tiberius to die and leave room for Caligula to succeed him, he was imprisoned. When Caligula finally became emperor in 37 AD, he not only released his friend but granted him rule of Philip's former tetrarchy (slightly extended), with the title of king. Josephus relates that Herodias, jealous at Agrippa's success, persuaded Antipas to ask Caligula for the title of king for himself. However, Agrippa simultaneously presented the emperor with a list of charges against the tetrarch: allegedly, he had conspired against Tiberius with Sejanus (executed in 31 AD) and was now plotting against Caligula with Artabanus. As evidence, Agrippa noted that Antipas had a stockpile of weaponry sufficient for 70,000 men. Hearing Antipas' admission to this last charge, Caligula decided to credit the allegations of conspiracy. In the summer of 39 AD, Antipas' money and territory were turned over to Agrippa, while he himself was exiled. The place of his exile is given by Josephus' Antiquities as in Gaul (Gallia Lugdunensis). (This may mean either the city of Lugdunum now known as Lyon, or the less important Lugdunum Convenarum, modern Saint-Bertrand-de-Comminges.) Caligula offered to allow Herodias, as Agrippa's sister, to retain her property. However, she chose instead to join her husband in exile. Antipas died in exile. The 3rd-century historian Cassius Dio seems to imply that Caligula had him killed, but this is usually treated with skepticism by modern historians. Among the followers of Jesus and members of the early Christian movement mentioned in the New Testament are Joanna, the wife of one of Antipas' stewards, and Manaen, a "foster-brother" or "companion" of Antipas (both translations are possible for the Greek σύντροφος). It has been conjectured that these were sources for early Christian knowledge of Antipas and his court. In any case, Antipas featured prominently in the New Testament in connection with the deaths of John the Baptist and Jesus (see above). The pseudepigraphical Gospel of Peter went further, stating that it was Antipas rather than Pilate who ordered the crucifixion of Jesus. In line with the work's anti-Judaic theme, it pointedly remarked that Herod and "the Jews", unlike Pilate, refused to "wash their hands" of responsibility for the death. Antipas has appeared in a large number of representations of the passion of Jesus — most notably portrayed by Frank Thring in King of Kings (1961), José Ferrer in The Greatest Story Ever Told (1965), and Christopher Plummer in Jesus of Nazareth (1977). Often, as in the films Jesus Christ Superstar (1973) and The Passion of the Christ (2004), Antipas is portrayed as effeminate (Antipas was played in those films by Joshua Mostel and Luca De Dominicis respectively); the origin of this tradition may have been Antipas' manipulation by his wife Herodias, as well as Christ's description of him as a "fox" in Luke 13:32, using a feminine word in the original Greek. In Salome (1953), he is portrayed by Charles Laughton, opposite Dame Judith Anderson as Herodias and Rita Hayworth in the title role. He also features in The Secret Magdalene by Ki Longfellow. In Longfellow's view, he was not effeminate so much as rash, ineffective, and when backed into a corner by his furious ex-father-in-law, willing to do anything to save himself. In Flaubert's "Herodias" (1877), Herodias uses her long-concealed daughter, Salome, to manipulate Herod sexually for her own political purposes. This conceit (original with Flaubert) inspired Oscar Wilde's play "Salome" (1891), the first version of the legend to show Salome with a will of her own, opposing her mother and lusting after John the Baptist herself. Naive and puzzled by her stepfather's lascivious attentions, the young girl arouses Herod in order to avenge herself on the prophet who has refused her advances. Flaubert's novella was turned into an opera by Jules Massenet (1881) in which Salome, ignorant of her royal parentage, becomes a disciple of the Baptist, who is then executed by the lustful and jealous Herod (a baritone). In Richard Strauss's operatic setting of Wilde's play (1905), Herod, one of the most difficult tenor roles in the repertory, is depicted as befuddled by both drink and lust, and in bitter conflict with his wife (as in Flaubert). At the end of the opera (as in Wilde's play), disgusted with Salome's behavior with the head of John, he orders her execution. Flaubert's novella was also, very roughly, the basis of the 1953 film "Salome," a Rita Hayworth vehicle directed by William Dieterle, in which the girl is implausibly unaware that her dancing will be used by her mother (Judith Anderson) to secure Herod's (Charles Laughton) consent to the execution of John the Baptist (Alan Badel). ^ "Mt 14:1 NASB - John the Baptist Beheaded - At that". Bible Gateway. Retrieved 2018-04-16. ^ "Mark 6:14-29 NASB - John's Fate Recalled - And King Herod". Bible Gateway. Retrieved 2018-04-16. ^ Jeffers, James S. (2000). The Greco-Roman World of the New Testament Era: Exploring the Background of Early Christianity. Intervarsity-Press. p. 125. ISBN 978-0830815890. Retrieved 29 September 2016. ^ Marshall, Taylor. The Eternal City (Dallas: St. John, 2012), pp. 35 - 65. ^ Steinmann, Andrew. From Abraham to Paul: A Biblical Chronology (St. Louis: Concordia, 2011), pp. 235–238. ^ Bruce, Frederick Fyvie (1990-12-01). Frederick Fyvie Bruce, The Acts of the Apostles (Eerdmans 1990 ISBN 978-080280966-7), p. 96. ISBN 9780802809667. Retrieved 2013-05-02. ^ "The House of Herod". Virtualreligion.net. Retrieved 2013-05-02. ^ Josephus, Antiquities 17.20, War 1.562. ^ Josephus, Antiquities 17.271–272, War 2.56. This Judas may be identical with the Judas of Galilee who led resistance to the Census of Quirinius (Schürer 381). ^ For Nabatean history, see Schürer 574–586. ^ Bruce 9, citing John 6:1 and 21:1 for the "Sea of Tiberias". ^ Matthew 14:3-4; Mark 6:17-18; Luke 3:19; Josephus, Antiquities 18.118. ^ Matthew 14:6-11; Mark 6:19-28. ^ Matthew 14:1-2; Mark 6:14-16; cf. Luke 9:7-9. ^ Luke 13:31-33. The "fox" had been interpreted as a symbol of either cunning or destruction (Schürer 342 and n. 5). Robert H. Gundry, noting that the Greek word is feminine, suggests that "Jesus is calling Herod a vixen ... not an animal to be afraid of or to run away from" (Gundry 3). ^ Luke 23:13-16; Bruce 17; Hoehner 89–90. ^ Lane Fox 297, citing Psalm 2:2 (also quoted in Acts 4:26). ^ Kenneth Frank Doig (1990). "New Testament Chronology". Nowoezone.com. Retrieved 2018-04-16. ^ Josephus, Antiquities 18.143���239, War 2.178–181; Bruce 19–20. ^ Luke 8:3 and Acts 13:1, with Bruce 13–14; Lane Fox 297 is skeptical. The Bible: Psalm 2:2; Matthew 14:1-11; Mark 6:14-28; Luke 3:1, 3:19-20, 8:3, 9:7-9, 13:31-33, 23:5-16; John 21:1; Acts 4:27, 13:1. Josephus, Antiquities 17–18, War 1–2. Bond, Helen K. (1998). Pontius Pilate in History and Interpretation. Society for New Testament Studies monograph series. Cambridge: Cambridge University Press. p. 149. ISBN 978-0-521-63114-3. Bruce, F. F. (1963–1965). "Herod Antipas, Tetrarch of Galilee and Peraea" (PDF). Annual of Leeds University Oriental Society. 5: 6–23. Retrieved 2007-10-19. Goodacre, Mark (May 1, 2004). "Herod Antipas in The Passion of the Christ". NT Blog. Retrieved 2009-06-08. Gundry, Robert H. "The Burden of the Passion" (PDF). SBL Forum. Society of Biblical Literature. Retrieved 2014-07-14. Hoehner, Harold W. (1970). "Why Did Pilate Hand Jesus Over to Antipas?" (PDF). In Ernst Bammel (ed.). The Trial of Jesus: Cambridge Studies in Honour of C. F. D. Moule. Studies in Biblical Theology. London: SCM Press. pp. 84–90. ISBN 978-0-334-01678-6. Jensen, Morten Hørning (2006). Herod Antipas in Galilee: The Literary and Archaeological Sources on the Reign of Herod Antipas and its Socio-economic Impact on Galilee. Wissenschaftliche Untersuchungen zum Neuen Testament. Tübingen: Mohr Siebeck. p. 121. ISBN 978-3-16-148967-9. ; 2nd rev. ed. (Tübingen, Mohr Siebeck, 2010) Wissenschaftliche Untersuchungen zum Neuen Testament 2.Reihe (WUNT II), 215. Lane Fox, Robin (1991). The Unauthorized Version: Truth and Fiction in the Bible. London: Viking. p. 297. ISBN 978-0-670-82412-0. Milwitzky, William (1901–1906). "Antipas (Herod Antipas)". In Isidore Singer; et al. (eds.). Jewish Encyclopedia. New York: Funk & Wagnalls. pp.��638–639. Retrieved 2007-10-19. Schürer, Emil (1973). The History of the Jewish People in the Age of Jesus Christ: Volume I. revised and edited by Geza Vermes, Fergus Millar and Matthew Black (revised English ed.). Edinburgh: T&T Clark. ISBN 978-0-567-02242-4. Pages 340–353 treat Antipas' reign. Sherwin-White, A. N. (1963). Roman Society and Roman Law in the New Testament. Oxford University Press. ISBN 978-0-8010-8148-4. Wikimedia Commons has media related to Herod Antipas.